Chris Carpenter, DVM, MBA, has worked for years to help young people explore their dreams of becoming veterinarians. 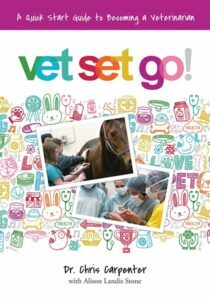 This passion for education led Dr. Carpenter to found Vet Set Go (vetsetgo.com)—the first, and only, web community dedicated to aspiring veterinarians—and write Vet Set Go!, a book that provides ideas on how “tweens” can pursue careers in veterinary medicine. Dr. Carpenter is the Executive Director of the Companion Animal Parasite Council and a member of the AVMA and the National Science Teachers Association. 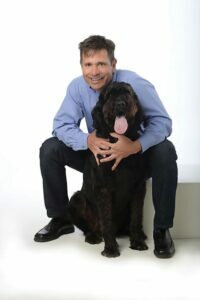 He received his veterinary degree from Auburn University College of Veterinary Medicine, his bachelor of science degree in microbiology from University of Florida, and an MBA from New Hampshire College. Can you tell us the main concept behind Vet Set Go? I’d like to point out 2 facts: First, almost 1 in 5 tweens (ages 9–14) wants to become a veterinarian. Second, the majority of practicing veterinarians today made the decision to become veterinarians before they were 13 years of age. What this data shows us is that veterinary medicine is a calling, and one that starts early in life. We know these tweens are passionate about their love of animals and their desire to become veterinarians. They just don’t know how to explore their dreams. You see, tweens who are aspiring veterinarians face a quandary: they want to get experience with animals, interact with veterinarians, and learn the science of animals, but they don’t know HOW. For example, most humane societies want volunteers to be 16 years of age or older. Similarly, most veterinarians will only let older teens shadow them. So how do younger, aspiring veterinarians explore their dreams? That is where Vet Set Go comes in. We encourage tweens to explore their dreams today and show them how to do it. We have specific ideas on how they can get animal experience and connect with veterinarians. We also believe the veterinary profession as a whole needs to reach out and connect with this important consumer group. Research shows, if we do, we will improve pet care and increase veterinary hospital visits today and into the future. What is the major benefit of embracing young people this age and helping them learn about veterinary medicine? These aspiring veterinarians want to talk to today’s practitioners and learn all they can about animals and veterinary careers. We need to interact with these tweens as much as possible and teach them about our profession and the importance of good animal care. The most important thing to remember is, while some of these aspiring veterinarians will become animal doctors, most will not. However, almost all of them will become something else—pet owners! If we reach out to them today and educate them about animal health, we will have well educated future clients that have a close connection to our profession. More important, research shows us that this group of tweens has a strong influence on the care of their current family pets. How did the idea of Vet Set Go grow and germinate for you? This whole journey started 6 years ago when I noticed how much my daughter and her generation explored their world via YouTube and other Internet video properties. She used an iPad at school and became extremely proficient early on at web navigation. This gave me an idea. I remembered how badly I wanted to see what veterinarians did when I was a tween—and aspiring veterinarian—and decided that I would go out and video veterinarians as they practiced. At first I went out and videoed my colleagues. Basically, these videos allowed veterinarians, who could only have 1 or 2 people shadow them a week, to reach literally tens of thousands of aspiring veterinarians. Veterinarians loved this idea! As did the audience of tweens who viewed the subsequent videos. As I continued making videos over the years, I learned about additional ways to expose tweens to veterinary medicine, including veterinary and zoo camps. Ultimately, the effort to share these opportunities with tweens led to the launch of vetsetgo.com in January 2016. In addition to Vet Set Go, how can veterinarians and their teams stimulate interest in veterinary medicine and good pet care from an early age? Every veterinarian needs to recognize what a gift they have been given when tween aspiring veterinarians come into the hospital and tell you about their aspirations to become veterinarians. Don’t dismiss them by saying, “Go study science and get animal experience.” Instead, recognize this opportunity for what it is—for both the health of your practice and the profession as a whole. If you have the time, set up a veterinary camp or open house specifically for this audience. If you feel you are too busy to do something large-scale, just have a resource available to offer, such as the Vet Set Go! book. If you provide future veterinarians with a free book when they share their dreams of pursuing this profession, you will gain their parents’ goodwill for life.